Somehow the Accidental Locavore managed to catch an episode of Jamie Oliver’s 15-Minute Meals the other day. 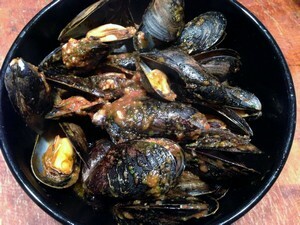 This one had him make a batch of mussels in a Moroccan-inspired sauce. Mussels are so easy to cook and these looked great! This will serve 2. In a roasting pan (or casserole that can go on the stove top) over low heat (you’ll probably need to use two burners) add the olive oil, garlic and harissa. Stir to combine. In a blender or food processor, add the tomatoes, cilantro, lemon, saffron and pepper. Process until pureed. Taste and add salt if needed. Add this to the roasting pan and mix well. Turn the heat to medium-high. 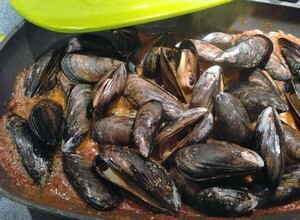 When the sauce starts to bubble, add the mussels in a single layer and cover with aluminum foil (pan will be hot, be careful not to burn yourself), or the lid if your pan has one. Cook for 5-7 minutes until all the mussels have opened. Serve with toasted bread to soak up the sauce and enjoy! My verdict: I’m always thinking I should be making mussels because they’re easy and delicious. These were amazing – simple, and a fabulous combination! Definitely going to be making these again (and again). May even have to buy a deep fryer to start making “frites” to go with them. I make my own preserved lemons, but you can order them online. My favorite harissa had gone bad, so I just used the regular stuff in a tube, but I’ve ordered more of the good one, so the next batch of mussels will be spectacular! Because of all the other strong flavors, I left the saffron out, thinking it might be wasted. This would also be a good sauce to cook fish or shrimp in and serve over couscous. *When you go to cook mussels, if there are any open ones, tap them on the counter. If they close, they’re fine, if not, toss them. Once they’re cooked, if they’re not open, toss those. Better safe than sorry.